AEG Live appointed London based creative and technical production specialists LarMac LIVE (LML) to help produce three stunning themed environments at the hugely successful 2013 Barclaycard ‘British Summer Time’ series of concerts in London’s Hyde Park. Staged by promoters AEG Live, the 10 days of activities – two weekends of three shows each headlined by The Rolling Stones, Bon Jovi, Lionel Ritchie and Jennifer Lopez, Elvis Costello and Ray Davies – took the whole Hyde Park ‘live’ concept into another dimension. The prominent themed areas helped the public enjoy and engage in an interesting, fun, quality guest experience which also benefitted from some glorious summer sunshine to accompany the superlative entertainment programme. LarMac LIVE’s Ian Greenway comments: "It is always exciting to be involved in something new and this was a fantastic project based on delivering high production values, great performance and a really diverse setting for all visitors to the event. Every show we do has its own personality, and it’s a great feeling to be involved in the inaugural year of a unique project." The LarMac LIVE team was led on site by Ian Greenway, with Siobhan Shaw assisting across creative and Matt Smith across stage production. The three ‘North Stages’ areas produced by LML – the Village Green, The Piazza and Havana – featured a total of five independent live music venues, showcasing an excellent line up of cool bands throughout the afternoons. Music fans could enjoy all of these close-up and personal with capacities ranging from an intimate 100 to a still ‘premium’ 750. LarMac LIVE started work on the project in November 2012 directly working with AEG’s event director Jim King and they were responsible for helping to deliver all the scenic elements throughout the areas plus they had full responsibility for the full technical production requirements for their live stages, a task undertaken with considerable style and underpinned by meticulous planning. They worked with a multitude of talent bookers, headed up by AEG’s Simon Jones, and provided stage management for five action packed programmes running concurrently, all managed by LML regulars. AEG’s initial vision for each area was then conceptualised and developed with Jim King, AEG’s director of events, and creative teams were appointed to produce the three areas. Matt Gates & Co designed and built The Village Green – LarMac has worked with him on many high-end corporate events - and Spacial (with whom LML has worked on many other shows) from Oxfordshire imagineered the Piazza and Carnival areas. LML worked closely with all of them on sourcing additional props – anything from genuine 1950s trucks and rusty bicycles to fountains and a myriad of park benches and pub garden tables and a considerable amount of living foliage. All the areas were produced with minute attention to detail and authenticity. The scenic elements have been specified and produced with five years of sustainability in mind. The idea was well received so it’s set to return in future years. LarMac LIVE brought in their regular technical suppliers to supply lighting and sound for the live areas, including Colour Sound Experiment who lit four of the five live stages. They also produced site-wide atmospheric lighting, bringing mood, ambience and a completely different look to the Park after dark. AEG’s creative brief included architecturally lighting of several buildings, which entailed installing a large quantity of LED lighting whilst the scenery was being constructed. Audio was supplied by SSE for all stages apart from The Bandstand, L-Acoustics for the Village Hall and The Barclaycard Unwind Theatre and Nexo systems for the Carnival stage and the Sony Music Unlimited secret stage. For the Bandstand, both lighting and sound came from Brighton based Firefly, running on solar generated power with a biodiesel back-up generator – making great use of the sun and soaring temperatures! Backline for all the stages was supplied by Music Bank, another company with whom LML has a strong relationship. The peace and tranquillity of a classical UK ‘village green’ enabled visitors to make the most of their time in Hyde Park, complete with several pubs, fairground attractions like a Ferris wheel and helter-skelter and a large park and seated area. The vibe was ebullient and the concessions boomed with business! The two live music venues, The Village Hall and The Bandstand featured a diverse line up of performers. On the first Sunday and during the week when there were no concerts on the main stage but the site was still open to the public, Marks & Spencer staged their Summertime Kitchen cooking competition in the Village Hall with sessions including James Martin and John Torode. The venue was designed as a truly multi-purpose space, transforming into a 500 seater demo studio. A taste of buzzy Mediterranean Europe embraced the flavours and style of Italy, France and Spain here, with numerous restaurants offering a host of continental cuisines, cafes and bars and a large amount of chilling space. 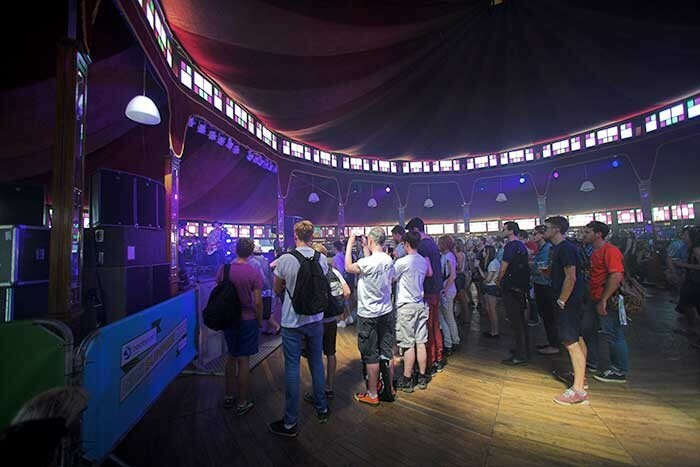 The two live music venues were The Barclaycard Unwind Theatre – a large Spiegel tent sitting behind a replica 9 metre high theatre entrance with a lively selection of emerging bands at the weekends and side-splitting comedy acts during the week - and the Sony Music Unlimited Stage. The fantastically colourful and vibrant Havana barrio turned up the heat and really got the party started! 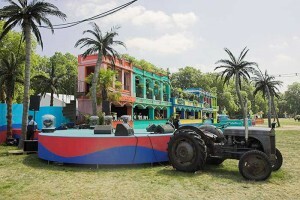 The entertainment programme include a myriad of Latino bands playing on the carnival stage – complete with vintage tractor - and sessions hosted by The Cuban Brothers, who performed on one of the balconies to the revelling throngs below. A Carnival Parade each afternoon proved to be one of the most popular activities of the day areas as people guzzled their caipirinhas, mojitos and moved and grooved the afternoon away, without the beach but complete with some fabulous palm trees sourced from Palmbrokers. Greenway sums up: "A massive amount of promoter and LML thought went into designing and producing these areas and making them stimulating and visually attractive as well as planning practicals like crowd management and movement. The process has utilised and re-thought many technical and creative skills and involved some great teamwork, all helping to break new ground and deliver something truly different." He adds: "Jim and the AEG team had put out some strong promises as part of their tender win, and didn’t let-up once about how integral these normally forgotten-about front of house and Northern stages were to the show, and that’s really shown in the end product." Jim King comments: "We set out with an incredibly ambitious vision for Barclaycard presents British Summer Time Hyde Park, and so when we were awarded the contract to run the events I needed a team to help me deliver this. "I’ve worked with Ian and Jo for more than 15 years and I knew that they were the perfect solution for us. The attention to detail we required was non-negotiable and they helped find the right contractors to execute the plan and skilfully and successfully deliver a very challenging project.